I've been quite busy helping my folks with some cleanup projects lately, but wanted to do at least a quick post from the Conflagration of Cousins week, which has now finally ended, as all but Anthony have returned to their various far-away corners of the world. We attempted a group shot of the six kids, a short but stressful event that was doomed to failure from the start due to lack of planning on the part of the photographer (me). First I'll recount what actually happened, then, based upon what I learned, what we should have done differently. I told all the parents (my siblings) to pair up with their kid and be ready in five minutes. Since my kid (Anthony) is six and the oldest and has a lot of experience standing while Daddy takes photos, I asked him to be helpful to the other kids so we could get a photo. 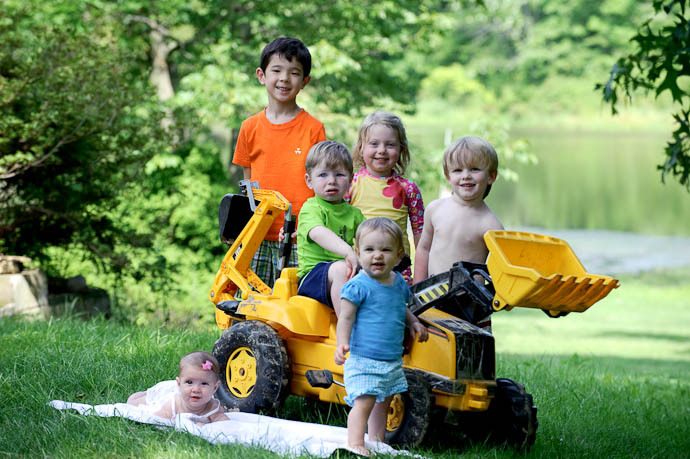 At the appointed time my sister Marci got the older four kids arranged on the toy backhoe as I found a good vantage spot for the camera, then the two babies were brought in and I started snapping shots. The two oldest looked at the camera and smiled, and the other four looked all around aimlessly, sometimes at one of the various adults arrayed around the yard, or at the sand pile, or whatever caught their attention for that microsecond. The older kids' attention then went to the younger kids who were not paying attention, and soon each of the six kids were looking in a different direction. Seeing this lack of photogenicity, the parents started jumping and yelling and clapping.... Look here honey..... smile.... look at Mommy..... smile..... The kids' reaction to this display of lunacy varied depending on the kid and the moment, but they ranged among indifference, smiles, bewilderment, and tears. The only ones not acting crazy were me ('cause I had the camera), and my folks. My mom, having gone through this each year for our Christmas picture when we were kids, just smiled and chuckled a well-earned “now it's your turn” chuckle. I'm below my Dad, standing on the backhoe stabilizer foot. We have wonderful shots from every year, and I actually remember the experiences for the ones starting when I was four years old. They're great memories now, but it was a huge ordeal to get the shots, as one or more of us kids were usually in a bad mood or otherwise uncooperative. Generally, once we were old enough to understand (that is, old enough to know that it was eating into our play time but we weren't getting anything out of it), we hated it. We all complained, and the moment the first picture was taken we all tried to bolt, only to be called back for a few more frames, “just in case”. Perhaps it's a bit late, but I think I speak for all my siblings when I finally say “sorry, and thanks” to my folks. I suppose the thanks applies not only to creating these photo memories, but also to little details like raising us to be good people. Thanks Mom and Dad. Oh, and by the way, the backhoe in the cousin shot is a homage to the 1974 family photo, my sister Marci's wonderful idea. So, what did I learn about taking a photo of a group of kids? First, parents and grandparents and other things that tend to grab a kid's attention should all be generally behind the camera, so that the kids appear to be looking at the camera if they're looking at someone. I have pictures where half of the kids are looking off to one side, and surprise surprise, my mom (way off to one side) has a picture at the exact same moment of half the kids looking right at her. In the “Crazies” photo above, one parent (Natalie) is too far off to the side, so her daughter (the infant, Titi) spent most of the time looking that way. Second, prep the older kids. Each parent of an old-enough kid should talk to the kid beforehand, one on one away from everyone else, and do whatever is required to put them in the right frame of mind to look at the camera and smile. Candy and bribes of toys if they do a good job are the order of the day here. If you're the type of parent who, like me, is reticent to use bribes, make an exception (or forego the photo shoot, unless a photo of a brooding, pouty kid is your idea of a fond memory). Third, prep the younger kids. This usually involves timing their naps or feedings so that they're in their best mood. If a kid is usually grumpy right after waking up (as I am), don't schedule the shoot for just after their nap. And have lots of treats on hand to ply them (and the photographer) with. Fourth, and this is just a guess, but I think it would have been helpful if the photographer had a really wild and silly hat of some kind, so that the parents could invite the kids to look at it. That's much easier, and more fun, than “look at the camera” or "look at Uncle Jeffy (even though you can't see him behind that big camera thingie)." Fifth, plan a bit more about exactly where the kids will stand, and do some tests ahead of time with something standing in for the kids, to test focus, background, and composition. I neglected to do this, and as a result, did not realize that Jena (the toddler standing in front) was slightly out of focus in every shot. I learned all this too late, and there wasn't a single photo (of the several dozen I took over the course of a minute or two) where more than half of the kids were looking at the camera with some semblance of a smile. But, this is the digital age, and I was able to take parts from four separate photos and comp them together in Photoshop to create the photo that leads this post. It's not great, but it'll make for a nice memory. Great advice for shooting kids Jeff. Something I picked up from a DIY photography site… “Pez” dispensers have a foot which can be altered very simply so they fit in the camera hotshoe. They stick up the camera and kids think they’re funny and look at them. The best bit is that you can change them to whatever character you want as Pez dispensers come in so many designs. Awesome post. Loved the blow by blow description. We have a similar experience with our extended family, and have learned similar tricks you outlined over time. Look at Jena standing so well at 10 months! I think the photo turned out very well. Four siblings, so where was the fifth sibling? as the families are now. You’re in Japan, where are the others? especially one that is as clean. a white barrel lense? In colour it reminds one of the competition. I love your family picture in 1974. It is “picture perfect” and I am sure a lot of prep done by your mom. I also like the expressions on Luke in each photo. He is so small so I am not sure what you would call it..it is cute! I was born in 1974! Love the three and the beautiful yellow color of the leaves. Your Mom is beautiful! Your are very lucky to have a wonderful family! Thanks for share this beautiful pictures! (1) The Pez thing works. I trot out a new one when I really need to get happy faces out of kids who have seen this before. But be careful — Mickey, Daffy, Goofy, Daisy and Hello Kitty work pretty well. Pooh, Tigger, and Eeyore don’t. That’s because kids smile while they make the long-E sound at the end of the first group, but make strange faces when saying the names of the latter group. Consider this when you choose your Pez dispensers. (3) Putting the parents and other distractions behind the camera is a workable approach. A better approach in my experience, is to get the parents and other distractions well out of sight. On seeing the cousins shot, and the one of parents trying to elicit desirable expressions–I was taken back about 30 years to Christmas 1979. We were trying to photograph my grandfather with his eight great-grandsons, mostly younger than three. The series is very funny, including one where my grandfather totally cracked up, since one or more was crying in each photograph. I think you did really well.